The fit of your blanket is extremely important to ensure the comfort of your horse and to prevent rubbing and blanket slippage. As horses of the same height at the wither come in a variety of shapes and sizes, it is useful to take certain measurements of your horse. Using a soft measuring tape, measure from (A) at the center point of the chest, across the point of the shoulder and to the point (B) at the center of the tail. 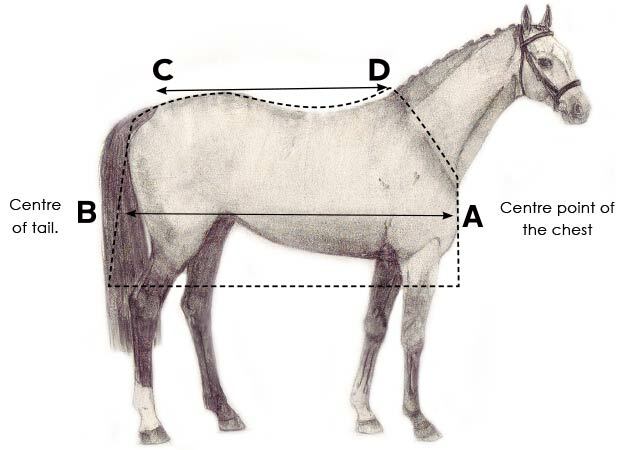 When you have the measurement, remove 10cm (4inches) and choose your horse’s size from the table below. Bear in mind that every horse is different and that this table is a guide only. We have many different styles to suit all shapes and sizes. Horseware® blankets come in a variety of weights. To make it easy, we’ve created this little temperature scale. It explains the weight available for each blanket and is located under each product section. A turnout blanket acts as a waterproof insulator layer, helping to maintain condition in cold weather. However be aware that conditions may vary in a short time span. Always ensure your horse is comfortable at all times. What blanket suits my horse? For an average build of horse, go with a classic neck cut or if you prefer to give them more comfort again, a V-Front fit would suit. Why should I use a Hood? Hoods are invaluable tools for us to keep the horse warm and dry. We spend all of our lives building topline in our horses so we should keep the topline warm. Many people forget that the majority of their horse’s neck is muscle. Keeping the neck warm keeps the overall horse warmer and reduces warm up time as the muscle is already warm and has good circulation. If you do not use hoods then the neck is more exposed, and depending on the horse’s coat, can make them colder. What do the different cuts mean? Classic cut, this sits just in front of the wither, then the neck cut curves down and around to give the straight classic cut neck with male/female closures. Surefit neck design, sitting further in front of the wither with a smoother slope to cup the front line of the shoulder and finish deeper in the front of the neck, Sure-fit by name and nature, this design gives a snugger fit yet the deeper neck allows more freedom to graze. Always used in conjunction with our V-Front closure, which provides freedom of shoulder movement to prevent rubbing and aids in reducing wither pressure. All-In-One has no seams from ears to tail along the top section. This is the perfect rug for narrow types who tend to loose condition as it has increased thermal insulation all the way through the rug.